In January’s Degustabox delivery there was a packet of Slim Noodles. I had never heard of these before so was looking forward to trying them. The packet had brilliant sounding claims all over it… Helps You Lose Weight, Fat Free, etc etc, but I couldn’t really see how noodles could be so good for you. 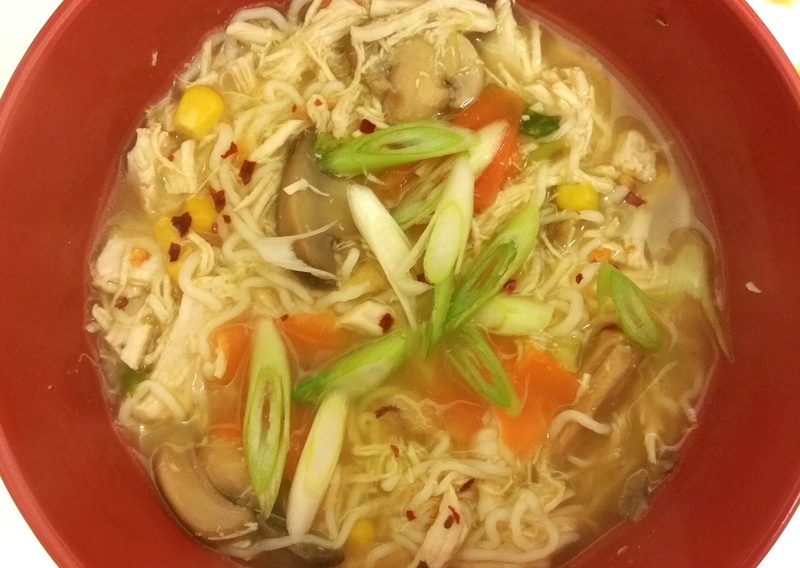 I decided to give them a go in a soup (my reasoning if I’m honest was that if the noodles weren’t that nice, the other tastes would disguise them). There is a note on the packet that you might notice a slight aroma when you open the packet but that would go after a few rinses under cold water. I’d say slight aroma is a bit of an understatement but luckily placing them in a sieve and letting the cold water tap pour over them did get rid of the not too pleasant smell. The smell made me wonder what on earth these noodles were made from and made me question whether eating them would count as a Bushtucker Trial, so I decided to look up the ingredients. These aren’t egg or rice noodles; these are made from organic oat fibre and organic konjac flour. I’d never heard of Konjac, so delved further. Konjac flour comes from the Konjac plant, otherwise known as elephant yam. The flour is rich in a water-soluble fibre called Glucomannan. This is what helps in weight loss. It absorbs huge amounts of liquid and swells up, so that when you eat it you’ll feel full quicker and for longer. You need to make sure you have a large glass of water when eating anything with this in, as it could be a choking hazard if you don’t have enough fluid. Luckily, cooking the noodles in a soup means they have plenty of liquid to absorb, so are better to eat. There are also rumours that it is these noodles that helped certain well-known celebrities lose a lot of weight. I don’t know how true they are though so won’t name names. Slim Noodles have no taste of their own. They absorb all the flavours of the foods you cook them with. They cook in minutes and are incredibly versatile. Use them in any dish you would normally use noodles in. They are high in fibre, fat free, sugar free, wheat free, gluten free, and have only 9 calories per 100g. They are great for vegans, vegetarians, and are good for diabetics as konjac flour helps to keep blood sugar levels at a low level. (Obviously my recipe is no good for vegetarians or vegans though). Pour the chicken stock into a large pan and add the garlic, ginger and soy sauce. Bring to the boil and then add the chicken. Cover and simmer gently for 15-20 minutes, until the chicken is cooked through and tender. Remove the chicken from the pan and shred it by using 2 forks to pull the pieces apart. Transfer back into the stock. Rinse the Slim Noodles well in a sieve under cold running water until there is no aroma. Drain well and add to the pan. Stir in well. Keep it simmering gently while you prepare the vegetables. Slice the spring onions diagonally, keeping one sliced onion aside for decoration. Use a potato peeler to very finely slice strips of carrot, or use a mandolin slicer if you have one. Add the sweetcorn, carrot, 3 spring onions, mushrooms and chilli flakes to the soup, stir well and allow to simmer for 1-2 minutes. Serve into bowls and sprinkle the remaining spring onion on top to decorate. Obviously you can add more or less of each ingredient to suit your needs. This was plenty for 3 of us to have a big bowlful each, with a bit leftover. The noodles really are filling though so you won’t want a huge amount. I hope you enjoy this recipe! 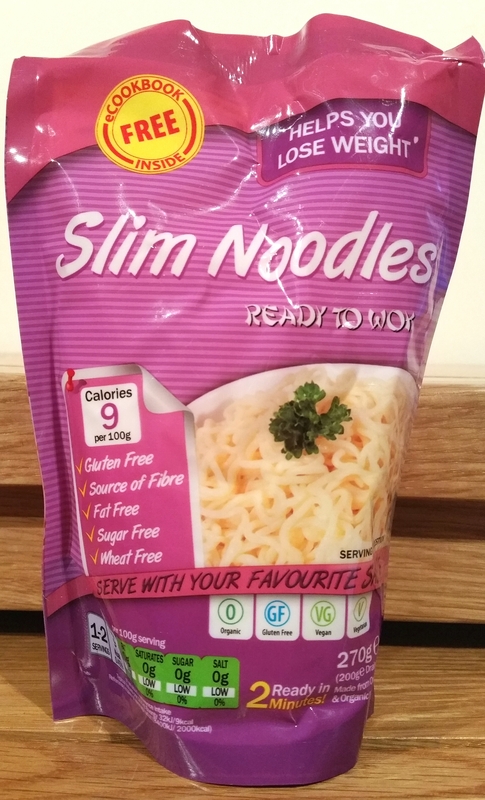 I received the Slim Noodles as part of a Degustabox parcel, but they are readily available from Holland and Barrett. What’s more, they’re in the Buy One Get One For a Penny deal too! Bargain!